Here are some care & usage instructions for your leads and collars. 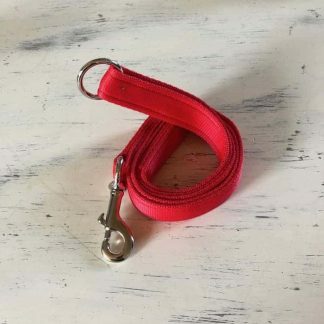 Choice of length – With regard to safety, consider if you will be able to hold your dog when s/he runs to the end of your lead and do not use a head collar. This is because if your dog is likely to run to the end of the lead, s/he will probably get a sharp jolt and there is a risk of injury. Brass or Nickel fittings? – What do you choose? Leads with brass fittings can be kept outdoors or used in the wet without drying and still work effectively. We only use the finest solid brass fittings. Our brass trigger hooks are solid brass and our O rings are solid brass Harness Rings. Care instructions for nickel trigger hooks – try not to leave them wet otherwise they will seize up. Nickel trigger hooks are oiled and checked before they leave me and you should oil them every now and then too. Unfortunately, we cannot replace nickel triggers after 6 months due to the abuse they can receive which can lead to them seizing up. 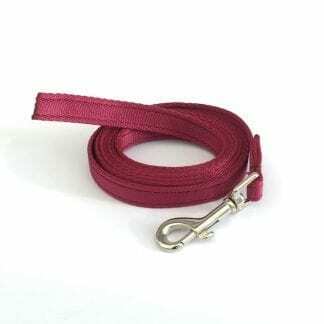 Double up dog lead – this means that you will be able to use the lead at half its’ length, so, for example, a 2-metre lead can be used at 1 metre. Washing – customers have reported that our leads can be washed, although I have never tried, I just replace them. They apparently come up great when washed by hand in warm soapy water and allowed to dry naturally. Tangling – Consider the areas where you use your dog training line and ask yourself if your dog is likely to get tangled around anything? 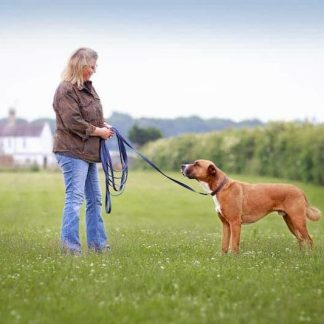 Use with other equipment – as stated above we strongly recommend that you DO NOT use a long line with a head collar because of the potential jarring effect on the dog’s neck when s/he runs to the end of the lead. Use your own judgement if you think your dog is calm enough for this not to cause injury. A properly fitted harness is a good solution and a better alternative to a collar. Any jarring will be absorbed by the dog’s body rather than the neck with a collar or head collar. You can expect a few years of use out of any of our products, but if we should fall short of your expectations or you have a quality issue with one of our products then please call Sarah on 01522 810150 or email sarah@megheathdogleads.co.uk and I will do everything I can to make sure that any problems you have experienced reach an amicable solution. Inspect daily / before use. Check for stitching faults, chewed webbing, broken trigger hooks or fraying. Do not use if your product is damaged in any way. Oil all trigger hooks and inspect before use. Check leads & collars are not chewed (frayed). If they are please do not use. Take extra care if you have a dog that is not allowed off the lead or lacking an obedient recall. Double check all of your equipment.